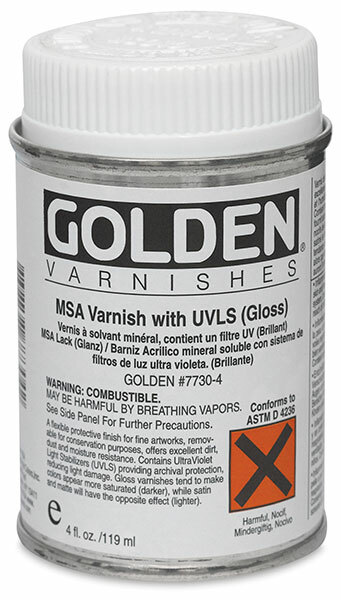 Golden's Mineral Spirit Acrylic (MSA) Varnish with Ultraviolet Light Stabilizers (UVLS) is a mineral spirit based acrylic resin system that can be applied to acrylic, oil, and alkyd painted surfaces. It is removable with mineral spirits after drying and can be used for interior or exterior applications. It is available in your choice of Gloss, Matte, or Satin finishes. 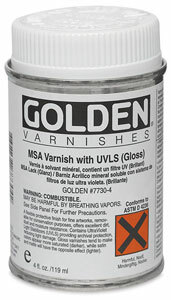 Note — Golden MSA Acrylic Varnish has a thicker viscosity than traditional varnishes, which helps maintain a more even suspension of solid particles. It must be thinned with Golden MSA Solvent before use. Golden MSA Solvent — Golden's MSA Solvent is the ideal solvent for thinning Golden MSA Topcoats, which must be thinned before use. MSA Solvent assures clear, clean, even application time after time. This solvent can also be used to remove an MSA topcoat at a later time for restoration purposes.